Northampton Township Business and Professional Association - Times Publishing Newspapers, Inc.
Would it be helpful if you could tap into a local database of knowledge and expertise available to you at the click of a mouse or a phone call away? Do you recognize the benefits of being involved in your local community, but don’t have the time or resources to do it on your own? If you live or operate a business in Northampton Township or one of its adjacent municipalities, you are invited to become a member of the Northampton Township Business and Professional Association. In these tough economic times, no one can afford not to explore additional avenues for growth. For a mere $100 per year, membership in NTBPA can offer you inclusion on their website, www.NTBPA.org, networking opportunities, interesting speakers on topics geared towards the small business owner, and different forums for community exposure. They’d love the opportunity to learn more about you and your business and would like to invite you to be their guest at one of their upcoming meetings. They also meet informally on the first Wednesday of the month for happy hour at a local restaurant. E-mail NTBPAInfo@gmail.com or visit www.NTBPA.org for more info. They’d love to meet you! 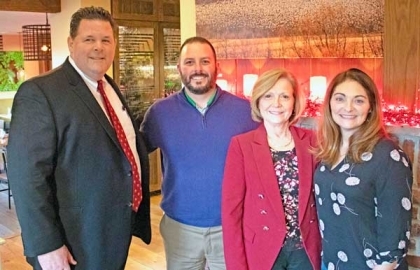 PHOTO CAP: Pictured from left, Advisor to Board Gerry Bowen, President Shaun Gavaghan, Board member Miriam Rogers, and Board member Kristin Reilly.